One of the poorest countries in South America, Paraguay was also among the last to transition to democracy. During the last months of 2018, several cases of intimidation and harassment of indigenous communities in Paraguay were reported. During the last months of 2018, several cases of intimidation and harassment of indigenous communities in Paraguay were reported. For example, on 7th November 2018, it was reported that around 80 police officers and soy producers from Brazil surrounded the land inhabited by the Makutinga indigenous community in San Rafael de el Paraná. The territory, where 28 indigenous families live, is part of the ancestral territory of Mbya Guarani and has been recognised by the National Indigenous Institute (INDI). Eriberto Fernández, community leader, said that they are "hostages in their own land". In December 2018, the citizen movement “Basta ya” issued a statement condemning the violation of the rights of indigenous communities due to agribusiness and the expansion of the soybean production. The movement demands that the government stop the evictions of indigenous communities from their ancestral land. In addition, on 10th December 2018, civil society organisation Coordinadora de Derechos Humanos del Paraguay (Paraguayan Human Rights Coordination, Codehupy) published the Human Rights Annual Report documenting an increasing number of conflicts between indigenous communities and corporations. The report identifies an increase in violent situations, especially among Guaraní communities of Tekoha Sauce, Itakyry, Jetyty Mirí, Makutinga, located in Alto Paraná, Canindeyú and Itapúa departments. In December 2018, media outlets reported that around 200 indigenous families occupied several areas in downtown Asuncion to demand a meeting with President Mario Abdo Benitez in addition to the dismissal of the head of the National Indigenous Institute (INDI) for "not defending their communities from people who want to uproot them from their land". The community camped in the areas for weeks despite threats of eviction by the police. The Constitution of Paraguay guarantees the freedom of association and no legal restrictions or bans on external funding are in place. The Constitution of Paraguay guarantees the freedom of association and no legal restrictions or bans on external funding are in place. Although land claims of some indigenous communities have been legally resolved, police raids, harassment by paramilitary forces and illegal evictions continue against others, while numerous peasant farmers are forced to sell their land. Judicial proceedings against peasant farmers are common and human rights defenders face repression, in particular those working for the defence of indigenous communities and against land confiscation. For example, human rights defender Lorenzo Areco, who was killed in 2013, was known for his work assisting farmers with land claims. According to the International Trade Union Confederation, trade union rights are also subject to regular violations, such as reprisals for strikes and delay or denial of registration. Although it is constitutionally guaranteed, the right to peaceful assembly is limited by laws imposing restrictions on the time and location in which demonstrations can take place. Although it is constitutionally guaranteed, the right to peaceful assembly is limited by laws imposing restrictions on the time and location in which demonstrations can take place. The government continues to intimidate protestors, especially students demanding better education, and the police use excessive force against peasants and union workers. Repression has not curtailed the exercise of the right however. 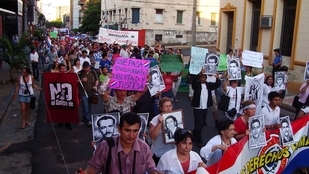 On 10 December 2014, International Human Rights Day, thousands – including teachers, public employees, farm workers and human rights advocates – marched in the capital Asunción to protest against homelessness, poverty, and unemployment, and to demand the president’s resignation. Recently, a union protest was met with excessive force by the police, leaving more than 20 people injured. The constitutionally guaranteed freedoms of expression and the press are significantly compromised in practice as well as by law. The constitutionally guaranteed freedoms of expression and the press are significantly compromised in practice as well as by law. Defamation is a criminal offence punishable with fines and prison sentences, and cases against journalists are regularly filed. The media landscape is highly concentrated, with three privately-owned media corporations having the influence to set the national media discourse. Although reporters are relatively safe in the capital city, they face significant danger in remote border areas, where local politicians operate in collusion with drug traffickers. At least three journalists were killed in Paraguay in 2014, and a total of 17 have been killed since 1991. Impunity and fear of reprisals have resulted in widespread self-censorship among reporters covering sensitive areas. Progress has also been registered as Paraguay, already an Open Government Partnership (OGP) member, passed a transparency and access to information law in September 2014 that came into force a year later. A positive development is the Senate decision to reject the approval of the so-called Pyrawebs bill that would have established mandatory data retention, which would have had a negative impact on the right to privacy and expression.